Dues are now $5.00, per year. A lifetime membership is $50.00. New members welcome. Meetings are held at 7 P.M., on the 4th Tuesday of the month, at the Museum Building or the Garst Memorial Library. The Historical Society has opened a museum in the old Kinderhook Library Building, (This building was an original Carnegie Library), located at 219 South Clay Street on the corner of Jackson. It is also available for group visits, schools, etc. The Museum is open through the summer, Sunday 1pm to 4pm and Monday-Friday 10am to 4pm. Anyone needing access to the Museum during the winter may make an appointment by calling the Museum at 468-7407 or 859-2036. An answering maching is now in place. Durning the winter months, some gift items such as the Jerry Rice prints, Hubble ornaments, books, etc., are also available through the Whitehurst Insurance office. Genealogy look-ups can be done. The volunteers at the Society are very helpful and go out of their way to find information for you! If online, you can contact Jan Gallagher, hj4wchs@yahoo.com This is a personal e-mail addressso in the subject line please put : "Webster County Historical Society Look-up". In the body, after the greeting, put as much information on the person being searched as you can, names, dates, and relationships. This will help our volunteers find what you need to know. Please include your complete name and mailing address, so we can send information to you. Please don't send mime or attachments---her computer can't read them. Marriage records from the courthouse can be copied for $1.00, per page. Library book copies are 15 cents each page, postage charges are reasonable also. 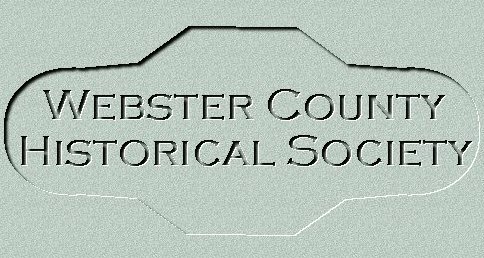 Or you can send your information to : Webster County Historical Society, P.O. Box 13, Marshfield, Missouri 65706. When the look-up is sent, you will be notified of copy and postage charges. If you are able to visit in person, there is a new research and resource room in the Museum with excellent sources. You can contact the Museum at 417-468-7407. You are the [an error occurred while processing this directive] visitor since January 27, 1999!